Pizzelles originated in Italy and were baked for celebrations. We carried on the tradition for the holidays but added our vanilla Beans and some anise. It’s such a welcoming flavor and oh so pretty! Preheat pizzelle iron. Coat with cooking spray and wipe off excess with a paper towel. No need to re-apply. Beat eggs and sugar. Add cooled melted butter, vanilla extract, vanilla seeds, anise seeds, and anise extract. Sift flour and baking powder in a bowl and add to the egg mixture. Beat until batter becomes thick, about 2-3 minutes. It will have a dough-like consistency. Knead with your hands for a couple of minutes until the dough is smooth and has a sheen. Using your hands, roll into 1-inch round balls. Offset just above of center of the pizzelle iron grids. Close the cover of the iron and bake for about 45 seconds, or until golden brown. Remove from iron and place on a cookie rack to cool. Dust with powdered sugar. 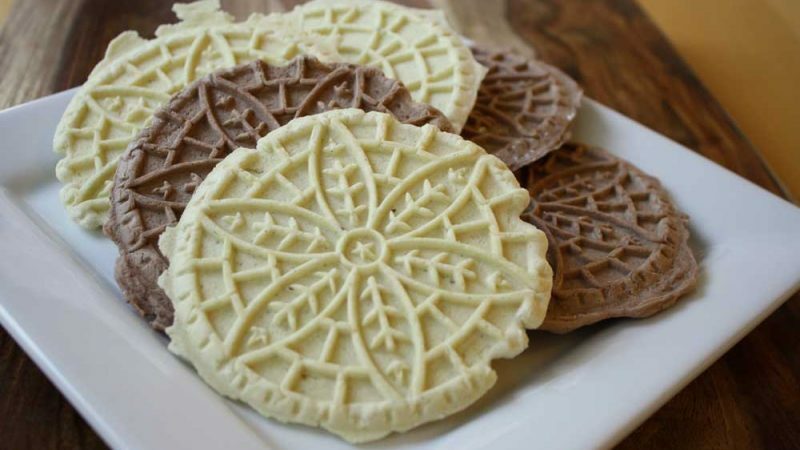 We divided the dough prior to kneading and added ½ cup sifted Rodelle Gourmet Baking Cocoa to half the dough to make chocolate pizzelles. Sift in 1 cup of cocoa to the flour mixture if you want all of the pizzelles to be chocolate flavored.